Our goal at Cotton Incorporated is to be on the forefront of cotton news, innovations and research and to share this information to benefit the industry. Here are trusted resources that we find useful and think you will too. See them all, or refine your search by category for a more customized experience. In this two minute video, University of Tennessee Cotton Specialist Tyson Raper explains how to use the upper most harvestable boll to determine defoliation timing. The weekly weather video. This video specifically addresses weather as it pertains to agricultural disciplines for this specific week. This free mobile app was created at Clemson University to aid in the proper calibration of spraying equipment. Both iOS and Android versions are available. A collection of webcasts released two times per month addresses timely cotton management issues. A collaborative project between Cotton Incorporated and the Plant Management Network. CRDC’s purpose is to support the performance of the Australian cotton industry: helping to increase both productivity and profitability of their growers. This resource provides the latest news and information on Arkansas row crop production. A good guide for diagnosing nutrient deficiencies, diseases, and herbicide injuries in cotton. The Clemson University website provides South Carolina cotton producers support in the areas of economics, cotton management, cotton resources and pest management. Discover the products which are most effective against common pests, in conditions relevant to you. This site provides a collection of general resources specific to managing cotton in Missouri. Links to production guides, pest management, and cotton budgets are provided. A collection of cotton production information from the University of California Agronomy Research and Information Center. Provides links to newsletters, production guidelines and variety trial results. Cotton management resources from the University of Arizona Cooperative Extension Service. Includes links to pest management information, crop production tips, and variety trial results. A collection of cotton related links to University of Florida cotton production information. Includes links to variety selection tools, production practices and budgets. Several links of interest to Alabama cotton producers, including variety trial results, IPM guides, and news. The guide that is provided as a PDF provides the latest cotton production recommendations from Virginia Cooperative Extension. A collection of cotton production information from the University of Tennessee including weed management, insect control, and variety trial results. Current news and cotton production recommendations from the North Carolina State University Cooperative Extension Service. Current news and cotton production recommendations from the University of Georgia Cooperative Extension Service. Cotton publications from the Department of Agronomy at Kansas State University. Includes links to a general production guide for cotton producers and Kansas variety performance tests results. This website contains information on several key areas of cotton production and management for Texas cotton producers and others in the southwest from Texas A&M University. The University of Arkansas Cooperative Extension Service provides up-to-date educational programs consisting of research-based information for profitable cotton production. The Mississippi Crop Situation blog provides producers, consultants, and industry within Mississippi with up-to-date, timely, and unbiased information to help maintain profitability. This guide outlines an overall Cotton IPM program and includes a Year-Round IPM Program Annual Checklist. Overview of key macroeconomic indicators impacting the world’s cotton supply chains with focus on downstream demand. This presentation will help cotton growers, consultants and Pest Control Advisers in California and Arizona understand the importance of managing whiteflies and aphids to prevent sticky cotton. This app offers a reference for cotton pests and control tactics in Texas. MOIST is a spreadsheet that uses a water balance approach to help schedule irrigations. A collection of tools available from the University of Missouri to increase irrigation water use efficiency. Includes investment costs guides, water use estimators, and information on pond design. A collection of tools from the University of Arkansas includes different ways to schedule irrigation and ways to improve the efficiency of furrow irrigation systems. For Apple Products: The GA Cotton Insect Advisor is an expert system for determining Extension prescribed insecticide treatments for management of stink bug pests in Georgia. For Android: The GA Cotton Insect Advisor is an expert system for determining Extension prescribed insecticide treatments for management of stink bug pests in Georgia. The page contains results from the latest variety trials conducted by the University of Missouri available for multiple locations. The site highlights many of the positive efforts the cotton industry is making to continuously adopt more sustainable practices. Provides several tools for tracking the fiber quality of U.S. cotton, including weekly and annual summary reports. Monthly cottonseed prices by region and supply/demand estimates. The home page of the South Carolina Cotton Board who represent local cotton producers. The Georgia Cotton Commission represents Georgia cotton producers and their site provides links to current cotton information and news. The website for the Oklahoma Cotton Council who serves the Oklahoma cotton industry. While focused on cotton ginning, the web site contains links to many regional cotton organizations within Texas. Web page for the Arizona Cotton Ginners Association and includes announcements and meetings of interest to all involved in Arizona cotton production. News and information for California cotton growers and ginners. This web site is designed to provide weather and climate data for Georgia's farmers and county agents. CIMIS weather stations are distributed throughout California. The data from these stations can be used to help determine when cotton irrigation is needed. AZSCHED (PC software) automatically retrieves data from Arizona weather stations. When combined with soil data and crop type, data can assist in scheduling irrigations. 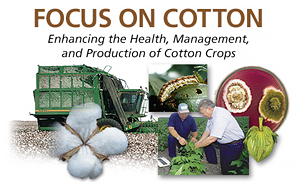 Agricultural and Environmental Research Division Information is available on Cotton Incorporated’s website. The National Cotton Council of America represents all U.S. cotton industry segments: producers, ginners, warehousers, merchants, cottonseed, cooperatives, and manufacturers. The North Carolina Cotton Producers Association website provides information of interest to N.C. cotton producers.